In the foreword to the twentieth-anniversary edition of Brave New World, author Aldous Huxley states that “a really efficient totalitarian state would be one in which...slaves do not have to be coerced, because they love their servitude” (xv). What tyrants face, according to Huxley, is “the problem of happiness;” that is, the challenge of manufacturing the illusion of utopian paradise under which oppression operates undetected as people are conditioned to feel comforted by the very society that oppresses them (xv). Jasmine, an arguably dystopian despot, appears in Angel’s season four and meets Huxley’s definition of efficient dictator by enthralling all whom she encounters into blissful subservience. The Jasmine arc bears striking resemblance to Huxley’s vision of dystopia, interacting with the literary model in ways that at first seem to subvert dystopian conventions. Yet, the seemingly subversive depiction of literary dystopia the Jasmine arc offers us ultimately retreats into containment and convention, concluding (just as Huxley did over 70 years ago) with an ominous warning about the nature of free will and the human tendency to prefer control to chaos. In order to establish fictive landscapes as dystopian, critic Peter Edgerly Firchow relates, the world must feel undesirable in relation to contemporary society (10). Towards this end, the dystopian genre depicts characters as sincerely oblivious to absurdly oppressive conditions. For example, as Brave New World opens, the platitudinous “Director of Hatcheries” escorts students through what readers recognize as a eugenics laboratory, describing the fertilization processes for different castes within the “social body” – including growth-inhibitors for the underclass Epsilon embryos so that they never develop beyond simian intelligence and remain complacent workers (3-15). “What an enormous saving to the community!” smiles the Director (15). Of course, the discord between his loving words and the horrific “progress” he describes alerts readers to the nightmarish underbelly of this brave new world. We see a similar sort of irony contextualizing the introduction of the Jasmine arc, the final six episodes of the fourth season: "Players" (4.17), "Shiny Happy People (4.18), “The Magic Bullet” (4.19), “Sacrifice” (4.20), “Peace Out” (4.21), and “Home” (4.22). Early on in “Shiny Happy People,” for example, when the mystically impregnated Cordelia gives birth to the mysterious goddess Jasmine, Angel and Connor gaze upon her but momentarily and, united in worship and wonder, immediately cease fighting each other and fall to their knees. This sudden camaraderie in reverence comes off as troubling and absurd – mere moments before, they’d been locked in mortal combat – and their devotion to Jasmine is so comically sudden and absolute that the audience immediately recognizes it to be an illusion, a brainwashing tool wielded by dystopian power seeking to mask its insidious agenda. Team Angel reinforces this irony in the following scene as well. While an anxious Team Angel awaits their hero’s return while he’s off fighting Connor and Cordy, they speculate over the status of his mission, whether Cordelia’s given birth to a monster, whether she’s still alive. As the Jasmine-struck Angel and Connor wistfully wander back into the team’s home base, the team rallies around them, assuming the estranged father and son are beaten and bruised from fighting Cordelia’s progeny. But as the team prepares to hunt and kill the unknown entity that’d been controlling Cordy from within her womb, Connor protests that killing is out of the question. “Since when?” questions Gunn. “Since we’ve all been saved,” rejoins Angel, in language reminiscent of religious epiphany and spiritual conversion (4.18). Fred replies in disbelief: “Um....well, that’s just....crazy talk,” confirming for the audience that Angel and Connor appear deluded from their perspective in the show as well as our perspective from without. Yet Angel, smiling and serene, takes the team’s weapons away from them, saying “We don’t want to kill her. We just want to find her. So we can worship her. That’s all” (4.18). Team Angel continues to express astonishment that Angel and Connor could be deluded by something so obviously false, and persist in attempting to convince Angel and Connor that their bliss is an enchantment. Wesley even explicitly urges them to remember the horrors Jasmine caused even while in her mothers womb, reminding them: “it’s a spell. It’s evil” (4.18). Yet Wesley’s appeal is in vain, for literally seconds later, Jasmine enters, bedazzling the rest of Team Angel and causing them to fall silently to the ground in reverence. Even after acknowledging the dystopian power lurking behind the veil, Team Angel assumes the same ludicrous devotion they themselves had been criticizing mere moments before, underscoring the irony and securing the show’s landscape under Jasmine as dystopian. A second element of Huxley’s that Angel revisits is a protagonist who shares with the audience disgust for and disenchantment with dystopian society, and who undergoes what I call the “anagnoristic arc:” the successive occurrence of four narrative events. The first event, anagnorisis, is the clear recognition of oppression behind the charade of utopia– another way to think of it, it’s when you realize “To Serve Man” is a cookbook, or that, gasp, “Soylent Green is people!” The second event, excursion, is a journey taken beyond the reaches of dystopian society, from which they return equipped with information to threaten the system. The third event, moral negotiation, features the protagonist deliberating whether to sacrifice safety and happiness, and the fourth is attempted subversion, in which the protagonist attempts to overthrow the dystopian system. As Brave New World unfolds, the character Bernard moves along an anagnoristic arc, becoming aware that the social body robs individuals of crucial freedoms. He exhibits discontent, wishing he were “not just a cell in the social body” (88). He wants to escape, and escape he does, to a degree. He journeys to the so-called “savage land,” an American Indian reservation unaffected by social body governance. Here, Bernard discovers Linda, who was stranded there twenty years ago by the Director of Hatcheries, and her son, John, who was born on the reservation. Returning with these two “savages” in tow, Bernard exposes the Director’s past and gets him fired for imposing the horror of natural childbirth on Linda (since children are engineered in test tubes, natural childbirth is considered obscene). Yet, as Bernard negotiates how much farther to push his discovery, he moves away from anagnoristic conviction and ends up bartering his specimens for more privilege under the dystopian regime. When John the savage attempts to galvanize a riot, Bernard meekly watches, and later, when he’s informed that he’s going to be exiled, he’s dragged away, screaming – “I haven’t done anything! It was the others! I promise I’ll do what I ought to do, give me another chance” (232). Bernard’s inability to sacrifice his newfound celebrity cause him to retreat into complacency, and the social body continues its utopian illusion undeterred. Fred instantly rebels, attempting to warn her friends even as they turn on her, forcing her to flee into the sewers. Fred’s flight amounts to excursion in that she, just like Bernard, seeks solutions beyond the borders of dystopian power, yet Angel reconfigures Huxley's convention to feature not self-imposed exile, but rather a fugitive being hunted. This revision serves to characterize Jasmine's spell as malicious and vindictive, further demonstrating to the audience the dystopian reality operating behind her enchantment. Fred further mirrors Bernard as Angel revisits a trope found in Huxley, the ritualistic handholding circle, during Fred’s period of flight. In Huxley, this convention takes the shape of the Solidarity Service, at which 12 people hold hands in a circle– “twelve of them ready to be made one, waiting to come together, to be fused, to lose their twelve separate identities into a larger being” (80). The twelve beat out a rhythm on their own bodies, going around the circle reciting platitudes as the beat grows and swells and erupts into an orgasmic collective cry lauding the social body. Yet Bernard feels nothing, and afterwards, “he was as miserably isolated now as he was when the service began – more isolated” (86). Thus the ritual circle, intended to physically connect members of the social body, serves Bernard only to reinforce his alienation from society. Jasmine leads the enthralled Team Angel in a similar sort of ritual in “The Magic Bullet” (4.19). While the liberated Fred manages to elude the ever-increasing mass of Jasmine’s followers, Jasmine remains unperturbed. She calls Team Angel to her, and informs them that they’re “all becoming connected...we’re going to find Fred.” She commands all of them to hold hands and close their eyes. Here, Jasmine participates in Huxley’s model, employing the ritual circle with the same holding of hands in concentration, the same channeling of energies towards furthering dystopian agenda, even similar rhetoric as Jasmine’s language of connectivity parallels Huxley’s depiction of the circle as single bodies waiting to be fused into a single body. The camera focuses in closely on Jasmine as she says, “I want you to picture Fred.” The camera begins panning right, a smooth, fluid shot circling round the Team Member’s faces bent in closed-eyed concentrated as they picture Fred, “what she looks like, her face, her big brown eyes, the way she styles her hair” (4.19). As the team’s energies unite on visualizing Fred, the camera pan picks up speed as the music swells, cinematographically echoing Huxley’s narration of the circle of Twelve. “Where are you, Fred?” asks Jasmine as the camera settles back on her face, still in close up. “I’m looking for you” (4.19). Meanwhile, somewhere in Los Angeles, a fugitive Fred wanders past an old woman lackadaisically smoking a cigarette. As Fred passes, something visibly jolts through the woman, as she snaps her head to give Fred a harrowing, purposeful stare. The camera cuts back to Jasmine’s handholding circle, as Jasmine smiles: “I see her. I see Fred.” By virtue of the handholding circle, Jasmine channels herself into the bodies of all of her followers, effectively using her followers as so many decentralized surveillance cameras. Just like Huxley, Jasmine’s ritual circle serves to solidify her absolute control of the bodies of her followers, and just like Huxley, the groupthink of the circle isolates the story’s independently minded individual. Yet whereas in Huxley, the ritual marks Bernard’s anomalous individuality within the circle, in Angel Jasmine uses the traits that individuate Fred to locate and attack her while she’s outside of the circle, using her followers as so many decentralized surveillance cameras. Jasmine’s weaponizing of her social-body power underscores the social body’s deep fear of individual will. In Angel, however, we see not one, but three interrelated anagnoristic arcs, each showcasing a resolve to subvert dystopia that Huxley’s protagonist never achieves. Fred, as mentioned above, is first to undergo anagnorisis when she gets her blood mixed with Jasmine’s, breaking the spell and glimpsing the reality behind Jasmine’s illusion. Unlike Bernard’s tepid, hesitant misgivings that stretch out over time, Fred instantly rebels, attempting to warn her friends even as they turn on her, forcing her to flee into the sewers and again featuring Huxley's trope of excursion. Yet Angel reconfigures the convention to feature not self-imposed exile, but rather a fugitive being hunted. This revision serves to characterize Jasmine's spell as malicious and vindictive, further demonstrating to the audience the dystopian reality operating behind her enchantment. Though Fred’s anagnoristic arc concludes with the subversive action she takes towards Jasmine in freeing Angel from the insidious enchantment, she succeeds in catalyzing anagnoristic arcs for Angel as well as Team Angel as a whole. Like Fred, once Angel, Lorne, Wes, and Gunn undergo anagnorisis, there is no attempt to bargain for celebrity or power under the system – it’s not a question of whether to rebel, only how, and when. True, as they undertake excursion and go on the lam, they all mourn the loss of the peace and bliss felt under Jasmine’s influence. Yet, the ensuing period of moral negotiation results in Team Angel collectively concluding that they prefer this misery to the deluded complacency of Jasmine’s thrall – better to be miserable and free than happily enslaved. Wesley discovers a creature from an alien dimension that Jasmine used to rule, and with the knowledge gleaned from conversing with the creature, realizes that Jasmine’s power can be undone by learning her true name. Wesley’s discovery enables Angel to voyage to the alien dimension in order to learn Jasmine’s name and destroy her illusory enthrallment. When Angel eventually returns from this excursion, he immediately takes subversive action, revealing the dystopian horrors lurking beneath her magnificent facade to the world. Perhaps the strongest point of comparison between Huxley and Angel lies in the concept of the social body. In Huxley, all society’s efforts go towards maintaining the social body by making people love their subjugation. Jasmine’s reign employs similar strategies. She performs her benevolence by removing suffering, bringing eternal bliss. “My love is all around you” is the refrain of her regime. Yet, in contrast to the faceless, figurative “social body” governing Huxley, Jasmine’s power is very noticeably rooted in her actual physicality. Jasmine embodies both utopian illusion and underlying dystopian power. It’s looking upon Jasmine’s form that initially enchants Connor and Angel, and she propagates her spell through visual contact, enthralling the world by exhibiting her physical self - going for a walk, appearing on the news, etc. Fred also admiringly stammers about Jasmine’s “holy bodiness” (4.18), and Angel and Lorne fondly call her their “mocha” and “cocoa-colored queen” (4.18, 4.19), foregrounding Jasmine’s physicality rendering her body a text on which is writ dystopian rule. These qualifying quips exhibit a preoccupation with Jasmine’s body that only becomes more pronounced as Jasmine’s power grows. She becomes able to physically possess her followers’ bodies for her own agenda. She tells Connor that she can feel all of her followers fusing together “like the cells of a single body.... my eyes, my skin, my limbs, and if need be, my fists.” Jasmine eventually is able to manipulate her follower’s bodies, creating an army of satellite slaves all bent on eliminating dissidence. For example, in “Sacrifice” (4.20), as the fleeing Team Angel stops to replenish their supplies, several passersby (all of whom clearly are physically possessed by Jasmine) form a menacing squad and close in on the heroes. “You’re a disease in the Body Jasmine,” sneers one such attacker in Jasmine’s actual voice, as he takes a swing at Angel’s face. Here, Jasmine explicitly engages Huxley’s rhetoric, articulating her status as the “Body Jasmine,” inserting herself into the social body paradigm just as she inserts herself into the bodies of her followers. Later on, as Connor and a team of Jasmine-worshipping soldiers attack Team Angel in the sewers, a gleeful and maniacal Jasmine holds her arms aloft, her flesh being ripped and shredded by invisible swords, her body receiving the wounds of her followers being slashed in the sewers, miles away. Jasmine, then, is literally the embodiment of Huxley’s social system, a centralized carnal command center pulling the strings of so many meat puppet minions. However, the Body Jasmine also problematizes Huxley’s social body metaphor by portraying an individual woman of color embodying the traditionally white patriarchal dystopia. Placing a woman of color at the top of the dystopian chain would seem to reverse Huxley’s vision, wherein the Epsilon underclass is dark skinned. And yet, while in general the placement of women of color in positions of power theoretically subverts Brave New World’s racial paradigm, Jasmine is portrayed as insidious and false (not to mention covered in maggot-infested rotting flesh) and must be defeated in order for the protagonists to emerge victorious. As it’s Connor who actually lands the killing blow, we see a white male triumphing over a woman of color, a fact that detracts from a reading of the Jasmine arc as empowering. The final dystopic element Huxley and Angel share is the exploration of the question of happiness vs. free will. Following Bernard’s forfeit of subversive action, he is taken to the office of Mustapha Mond, who explains that the social body eliminates messy, inconvenient, and often painful concepts like beauty and truth. The social body paradigm “hasn’t been very good for truth, of course.. but it’s been very good for happiness...happiness has got to be paid for,” In Huxley, the price is free will, and John the savage ultimately illustrates this point when he claims “the right to be unhappy,” committing suicide (232). Angel’s Jasmine arc similarly concludes with dystopian power articulating this tradeoff. When Team Angel finally succeeds in revealing the dystopian horror behind Jasmine’s spell, Angel’s L.A. tumbles into riotous hysteria, and the defeated and furious Jasmine accuses Angel of making a terrible mistake. “Do you have any idea what you’ve done?” hurls the dethroned despot at Angel over the roar of the riots. Angel, steadfast in his resolve, replies “what I had to do.” Jasmine, in her lunacy, shrieks “there are no absolutes, no right and wrong....there are only choices!” She pauses, as her words sink in. She gestures to the chaos around her, and continues: “I offered paradise! You chose this!” Angel jumps on her phrasing, righteously reaffirming his choice to take subversive action against her regime: “Because I could. Because that’s what you took away from us. Choice.” Jasmine rejoins, with a malicious sneer: “And look where free will has gotten you. This world is doomed to drown in its own blood now” (4.21). The frenzied hysteria and wailing sirens in the blurred background of these shots reinforce the threads of truth woven through Jasmine’s words: the world without Jasmine does indeed seem brutal and bloody in comparison to her utopian illusion. Although Angel (and the audience along with him) deeply wants to believe that the world is better off without Jasmine, her rebuttal causes him to falter, and defend himself: “Hey, I didn’t say we were smart, I said it’s our right. It’s what makes us human” (4.21). Here, Angel asserts that same viewpoint espoused through the character of John the Savage, that which Huxley’s aims to inspire in readers; namely, that miserable reality is preferable to happy slavery, and that being unhappy and feeling the full spectrum of human emotion is a human right. And if the show ended there, with the assertion that it’s better to be miserable and free than to be happily oppressed, the show would indeed appear to subvert the dystopian literary model on which it builds. Yet Angel extends the dystopian narrative; rather than ending with the certainty of Angel’s assertion, Jasmine continues to argue her point. When Angel accuses her of murdering people, she reminds him that, as a vampire, he also possesses a violent and bloodthirsty past – violence that didn’t carry with it the pleasant side effect of promoting peace on earth. Angel persists, declaiming “thousands of people are dead because of what you’ve done,” yet Jasmine quickly replies “and how many people will die because of you? I could have stopped it... war, disease, poverty...how many precious lives could have been saved in just a handful of years?” (4.21). Jasmine’s equation causes Angel to falter in his righteousness. As a champion of the helpless, Angel knows firsthand the misery and suffering that exist beyond his power to help, the feeling of futility at fighting a wave of evil one drop at a time. As he seems to reconsider the merit of his subversive action, the show once again addresses Mustapha Mond’s assertion that free will leads to chaos. Further, as he heads to home base with the rest of the team, a posthumous Lilah Morgan visits them, offering Team Angel ownership and control of the LA branch of Wolfram and Hart as a reward for destroying Jasmine’s “world peace” (4.22). Their certainty shaken by this phrase, Team Angel insists that what Jasmine offered wasn’t world peace, but a slave state. Echoing both Mond in Huxley and Jasmine before her, Lilah states that “world peace comes at a price. Jasmine knew that. She consumed... what, a few dozen souls a day? Now weight that against the suffering of millions” (4.22). In echoing Jasmine’s equation, Lilah compounds Team Angel’s uncertainty. Once she’s left them to consider the offer, the team collectively questions their actions: did they really end world peace? The emphasis placed on Team Angel’s reconsideration of their subversion reveals a sub-textual, Huxley-like cynicism that wonders if humanity may be better off happily enslaved. To further complicate the issue, Connor begins to parallel John the Savage as he undertakes a suicidal terrorist plot, arming himself and innocent bystanders with bombs, as well as the unconscious Cordelia (who’s been in a coma ever since Jasmine’s mystical birth). Connor’s violent plan enacts a sort of existential rebellion, fully exercising his freedom to be miserable and destructive and illustrating the horrific underbelly of that spectrum of human emotion which Jasmine supplanted with blissful complacency and which Team Angel fought to preserve. In Angel’s reaction to Connor’s behavior, Angel as a show retreats away from its subversive depiction of dystopian narrative and moves back into the containment of Huxley’s pessimistic model. While the rest of Team Angel rationalizes that they could reform Wolfram and Hart and use the firm’s resources for good, they seem on the brink of accepting the deal. Yet before the team can reach consensus, Angel sees news footage of Connor’s terrorist-hostage situation in progress, and negotiates with Wolfram and Hart to create a false, happy life for Connor and revert the world to how it was before Jasmine’s reign. 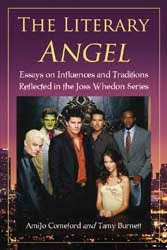 He accepts the morally suspect offer on the condition that firm mystically tampers with his friends’ minds and memories, and in doing so, Angel’s deal enacts the same tyrannical cloaking of dystopian reality in a veil of utopian illusion against which he so adamantly fought.. Not only does Angel remove Connor’s right to choose misery and suicide, he alters his friends’ minds without their consent, and moreover, he does so in the context of becoming part of the institutionalized evil he’s been fighting for four seasons. Free will, then, has gotten Angel into exactly the same project of masking undesirable reality in paradisiacal illusion, suggesting that free will leads to choosing safety over subversion. Two ways to interpret this troubling conclusion present themselves. On the one hand, a pessimistic reading suggests that Angel’s decision evinces corruption, that Huxley’s axiom remains true – people would rather be happily enslaved than suffer the unpredictable extremes that go along with free will. Yet (as I argue in an expanded version of this paper’s in The Literary Angel, forthcoming from McFarland, and as I will argue in my presentation at the Slayage conference this June), I prefer a more optimistic interpretation. By taking control of Wolfram and Hart, Team Angel positions themselves to defy Wolfram and Hart’s senior partners in the season five finale, eventually taking decisive subversive action on a much larger scale. Booker, Keith M. The Dystopian Impulse in Modern Literature: Fiction as Social Criticism. Connecticut: Greenwood Press, 1994. Firchow, Peter Edgerly. Modern Utopian Fictions from H.G. Wells to Iris Murdoch. Washington, D. C.: Catholic University of America Press, 2007. “Home,” Angel. Creat. Joss Whedon, David Greenwalt. Dir., Writ. Tim Minear. DVD. 1999. 20th Century Fox Home Video, 2003. Huxley, Alduous. Brave New World. 1932. Reprint. New York: Harper & Row, 1989. Jowett, Lorna. “Angel as Critical Dystopia.” Critical Studies in Television 2 (Spring 2007) 74-89. “Peace Out.” Angel. Creat. Joss Whedon, David Greenwalt. Dir. Jefferson Kibbee. Writ. David Fury. DVD. 1999. 20th Century Fox Home Video, 2003. “Sacrifice.” Angel. Creat. Joss Whedon, David Greenwalt. Dir. David Straiton. Writ. Ben Edlund. DVD. 1999. 20th Century Fox Home Video, 2003. “Shiny Happy People.” Angel. Creat. Joss Whedon, David Greenwalt. Writ. Elizabeth Craft and Sarah Fain. Dir. Maria Grabiak. 1999. DVD. 20th Century Fox Home Video, 2003. “The Magic Bullet.” Angel. Creat. Joss Whedon, David Greenwalt. Dir., Writ. Jeffrey Bell. 1999. DVD. 20th Century Fox Home Video, 2003.